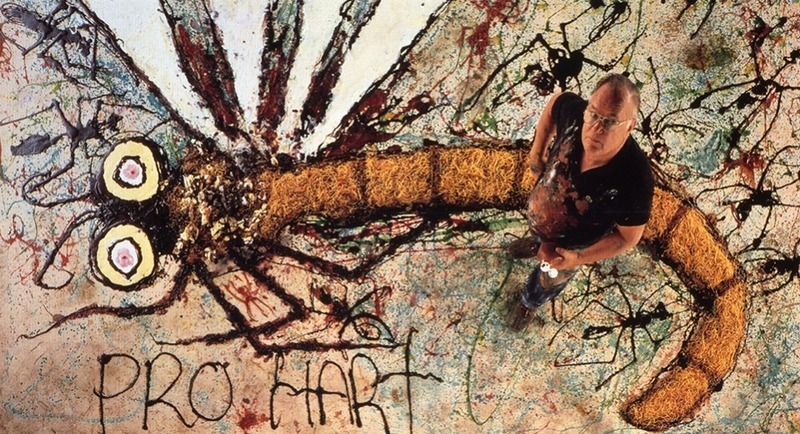 Twenty years ago well known Artist & Australian Icon Pro Hart used his unique artistic flair to cover Stainmaster carpet with spaghetti & cake to form the famous “Dragonfly” that Pro Hart was best known for. This carpet commercial was rated in the top 25 best commercials of all time & will be remembered for generations to come. Sadly in 2006 Pro passed away which was a great loss for Australian art & also his most loyal audience being his family, particularly his protégé, youngest son & now established professional artist David Hart. It appears that not only was Pro’s remarkable talent passed onto David but it would seem that talent definitely flows down from generation to generation, now with David’s youngest son Harrison being the new face of “expressionist art”. 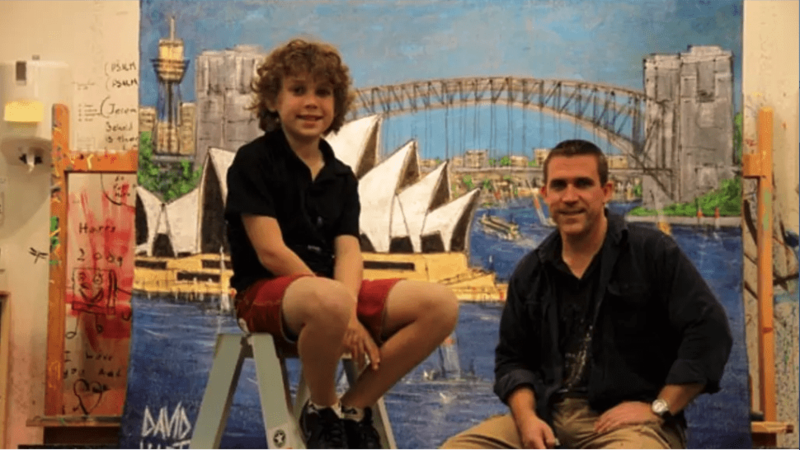 Harry, Pro’s 9 year old grandson was honored to be in the new generation Stainmaster Carpet commercial boosting the same art antics as his late Grandfather. 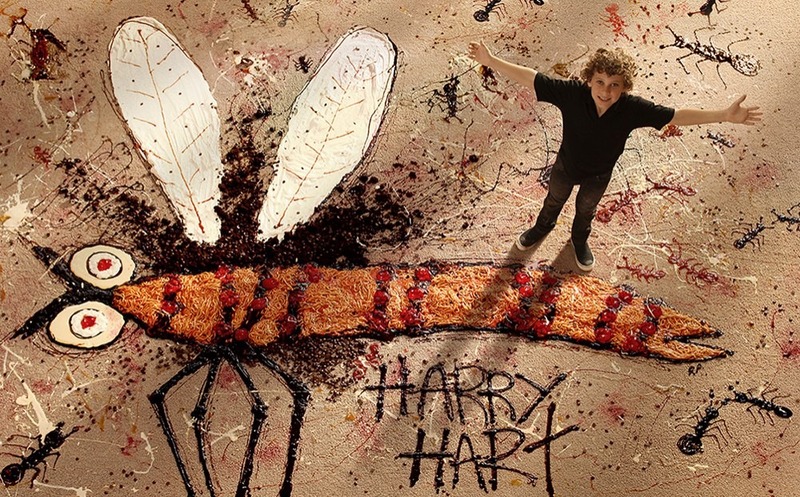 Harry Hart used unusual and innovative techniques to create his own “Dragonfly” masterpiece from food, drink and sauces. In this latest commercial Harry can be seen boogie boarding across spaghetti and using toys including a water pistol, a pair of jumping boots and a remote controlled car to apply the brushstrokes to his canvas. As Harry decorated, his father David Hart, a highly successful painter in his own right, watched proudly from the sidelines however Harry’s mother Christine got far more involved by taking on a role in the commercial. 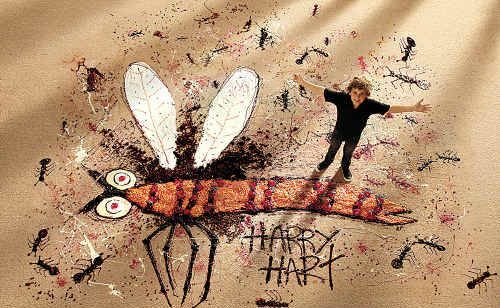 The new commercial brings things closer to home by having Harry’s mum discover his “dragonfly” masterpiece on the carpet. As a proud mum, Christine has no trouble admiring her son’s handiwork. Thanks to STAINMASTER® XTRA LIFE™ carpet, she also has no trouble cleaning off Harry’s masterpiece and restoring the carpet to its original, pristine condition. But perhaps the moment that makes Christine’s performance is when she takes a break from cleaning the carpet and mutters under her breath “Oh you’re too much like your grandfather”. Whilst Pro may be gone, it’s nice to know that his spirit lives on. It’s also nice to see the spirit of the original STAINMASTER® carpet commercial so alive and well in the new version. As a man who loved his family, innovative art and STAINMASTER® carpet, we think Pro would be pleased.